Winners, Bregado Flax Educational Centre with (back row L-R) Small Business Manager and Scotiabank Kiddy Cricket Liaison, Andy Davis; BVICA President, Mr. Shan Mohamed; Coach, Gloria Fahie; and Charlie Jackson, WICB and BVICA Kiddy Cricket Programe Coordinator. 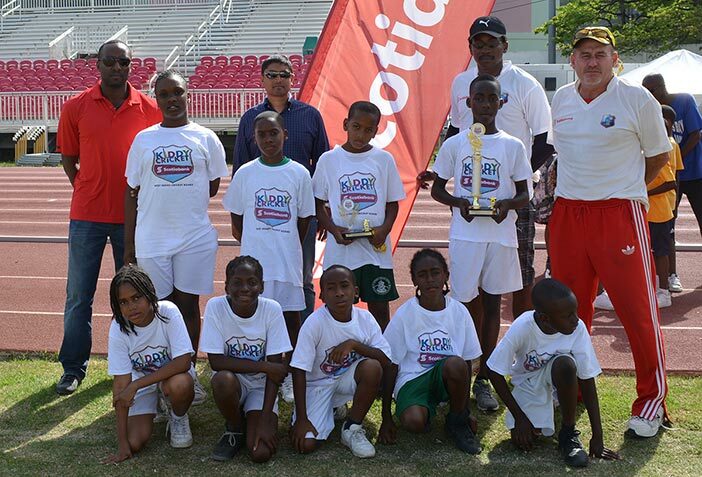 Led by T’Koy Richardson, the Bregado Flax Educational Center Primary Division (BFEC) secured the 2014 Scotiabank Kiddy Cricket Easter Festival Championship at the A. O Shirley Recreation Grounds on Friday. Richardson was named Best Performing Batsman for his skillful performance that was crucially important for BFEC’s 121 from their 10 overs against St. Georges in the championship game. Teams of ten, including a minimum of four girls, took to the field at the cricket festival which culminated in a round robin final involving St Georges Primary, First Impressions Primary and eventual winners BFEC. Zoro George made his mark for BFEC, Chakia Smith for St Georges and Amari Dupuis for First Impressions. In the first game of the round robin, First Impressions posted an impressive 101, mainly thanks to a 13-run partnership between Jalen Prentice and Jerome Parkins. Ella Tikeli and Jermaine Arthur added some late pyrotechnics including the day’s first maximum from the broad, but plastic, bat of Arthur. In reply St Georges struggled early on and it wasn’t until Jeremy Grant and Adrian Padilla came together late in the inning that a serious threat was launched on the winning target. However although the pair took St Georges to the brink of victory a crucial “out” was conceded and they ended up on 96. BFEC then took on St Georges knowing they had to win and win big if they hoped to lift the championship. They lost the toss and St Georges decided to bat first with a revamped line up, but were unable to gain any dominance over some tight BFEC bowling. Kyron McMaster and Grant did their best to post a fighting total, but athletic, IPL style fielding, kept them check. It was left to Tayshaun Williams and Grant, batting as a replacement, to lift the total to 73. Jeroen Adams (First Impressions) was named Best Bowler and Jeremy Grant (St Georges), Best Fielder. 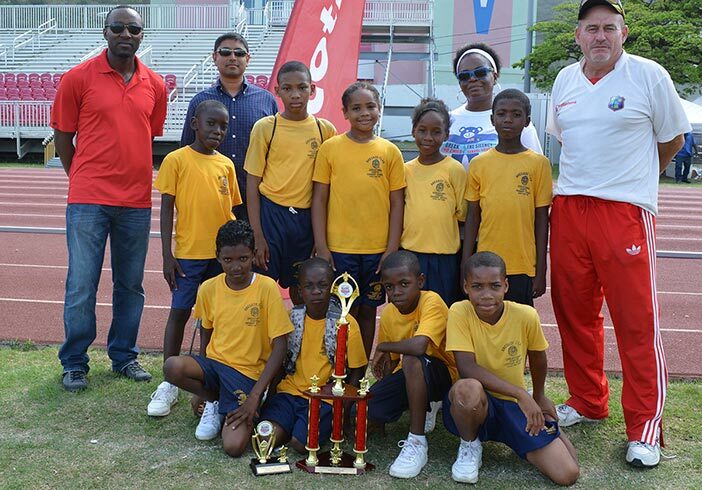 Most Improved School was First Impressions while the Most Disciplined School was St Georges. President of the BVI Cricket Association, Mr. Shan Mohamed said he is pleased with the progress being made in the schools with the support of Scotiabank. “The idea of the Festival is to develop basic skills among students who are very anxious to learn and play the game of cricket. As an association we are very happy with the improved skill level of the players which is very important for us as an Association as we continually evaluate our programs. With continued support of Scotiabank, it will only be a few more years before we start to see players from the BVI playing at the regional level and hopefully at the international level. The possibilities are endless,” Mr. Mohamed stated. 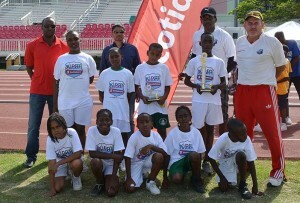 “From celebrating cricket’s heritage to developing cricket-themed educational programs for children, we support the advancement of the sport through our continued sponsorship of the West Indies Cricket Board and our partnership with the BVI Cricket Association, closer to home,” said Small Business Manager and Scotiabank Kiddy Cricket liaison, Andy Davis. Charlie Jackson, WICB and BVICA Kiddy Cricket Programme Coordinator explained that the format for the matches was ten overs per side with the batting side split into pairs with each pair facing two overs each and the team starting on 100 runs. Unlimited chances to bat again were available if out, but at a cost of a 6 run deduction and each batsman could only face 3 balls per over. Everyone had to bowl one over and before the games started the teams went through a bowling skill challenge where each player had two attempts to hit the wickets or at least be accurate enough to bowl through two cones placed either side of the stumps. The best bowlers from each team were awarded the “skill challenge ball” to go with everyone wearing branded Scotiabank/WICB branded T-shirts. They were also presented with a Kiddy Cricket back packs.